Another gold medal stamp for tomorrow already assured! A gold medal before most people have had breakfast - and we'll be showing that later. Meanwhile, there's an interesting article about the production operation and the process for ensuring that the stamps reached Post Offices on the following day, even when the medal wasn't won until 10.30 pm in Print Week. 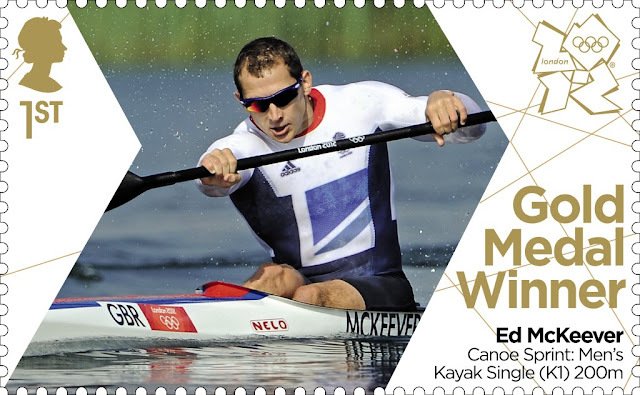 Ed McKeever powered to victory in the men's 200m kayak to win Britain's 26th gold of the Olympics.The 28-year-old dominated the K1 single final, with Spaniard Saul Craviotto Rivero taking silver and Canada's Mark de Jonge bronze. And one edit is followed immediately by another as Mo Farah wins the 5,000 metres!